Create a space you’ll be proud to call home with the Tiago Collection furniture by Parisot. It’s contemporary and stylish, and eclectic in design to be harmonious with your existing home décor. The two-tone color scheme combines the rich brown of Brazilian Walnut foil finish and the grayed tones of solid Putty premium veneers. Our veneers are made to last, and resist scratches, dents, chips, stains and damage from water rings! 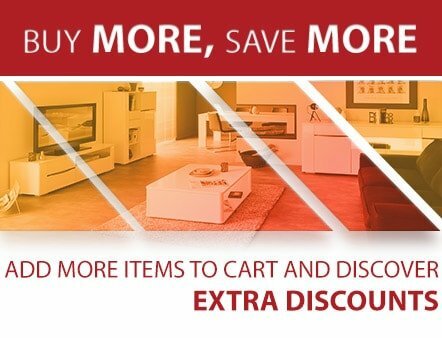 Whenever you choose a Parisot product, you are getting ingenious storage options that maximize your home or office space, as well as an eco-friendly product from sourced wood to finished product! The Tiago collection provides options to mix and match pieces between dining and living room spaces, like the sideboard chest that can be placed in the dining room, front foyer, or living room space, or the display cabinet and bookcase that can be used in any room! Furniture like the TV table and coffee table provide maximum organization and storage, so clutter is out of sight and your main living areas always look picture perfect! In today’s homes, especially smaller, downsized homes, we need to think storage as well as beauty when it comes to our furniture choices. This sophisticated Tiago coffee table provides a beautiful focal point in the living or family room space, with décor accents, candles, plants, and more. At 42” l..
To create a modern dining experience in your home, you need a table that will be a beautiful focal point, yet blend well with your existing furnishings and color scheme. 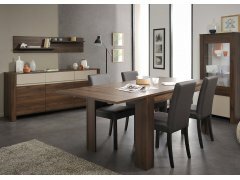 The Tiago dining table provides rich color, from premium Brazilian Walnut foil finish veneer; it is as durable as it is beautiful,.. The Parisot Tiago Glass Door Storage Cabinet is designed to display your collections, your heirlooms, your favorite things! The glass door front reveals three thick glass shelves that are lit by an overhead spotlight in the top of the cabinet, providing ambiance and elegance to your room décor. The .. Storage is the name of the game with the Tiago TV Table by Parisot! There is roomy top surface, approximately 5’by 15” in dimension that is perfect for a large flat screen TV. Underneath the top are two shelves, open for electronic equipment, remote, and controllers to be stored neatly. There’s even..